Managing a website has become so much easier over the past ten years each year painful manual tasks are being automated to help us create better performing websites. One side of digital marketing that is often ignored is the publishing side if you're a blog or a larger content distributor monetizing your efforts through ads you'll know how hard it can be to keep that revenue stream running smoothly. While great webmaster and digital marketer don't need tools to get the job down, but I'd be damned if I'd let a time-saving tool pass me by, one of those tools is Google Publisher Toolbar. This nifty little Chrome extension helps you debug ad placements and make solving ad tag issues easy, until now. As Google begins to consolidate its marketing tools, we will see uptake changes and updates to existing tools and sadly Google Publisher Tool Bar is being stripped of some of its features. On July 23, 2018, the Google Publisher Toolbar will sunset support for DoubleClick for Publishers (DFP) and DoubleClick Ad Exchange. Users will then be forced to use DFP delivery tools and the Google Publisher Console to troubleshoot delivery, and DFP reports to monitor performance. While support for AdSense and Google Analytics will continue, unaffected. Why use Google Publisher toolbar? 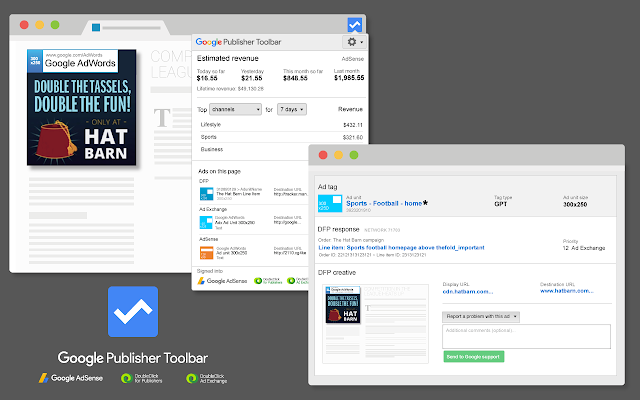 Google Publisher Toolbar turns your Chrome browser into a debugging tool and allows you to view data on your AdSense, Ad Exchange, and DoubleClick for Publishers ads and Analytics accounts, debug issues and block unsuitable ads on your site. 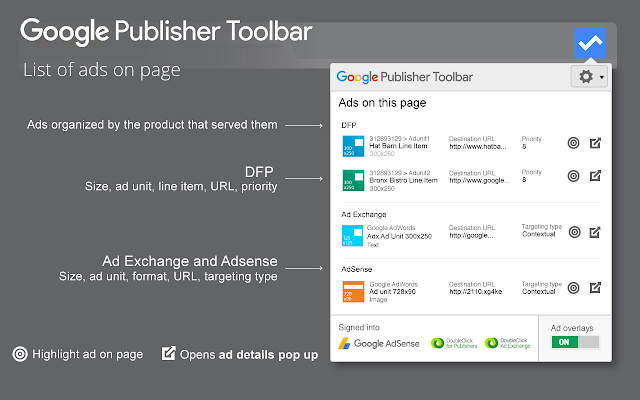 Whether you're using AdSense, Ad Exchange or DoubleClick for Publishers, with the Google Publisher Toolbar, you can view information on each of your Google ads, block unsuitable creatives, and see an account overview, all while browsing your own site. • The top five channels or top five sites in descending order of revenue for today, yesterday, seven days, this month and previous month. The Google Publisher Toolbar extension is only available on desktop environments and in one browser, Chrome, but with its new tool consolidation and new platforms coming into play Google has decided instead of to double down for now and remove features as they work on developing holistic solutions, or so they claim. Below is a guide for where to find familiar Google Publisher Toolbar functionality after this change. Use DFP reports to see estimated revenue for your account or specific channels and URLs. You can even schedule and share a report to see results on a regular basis. 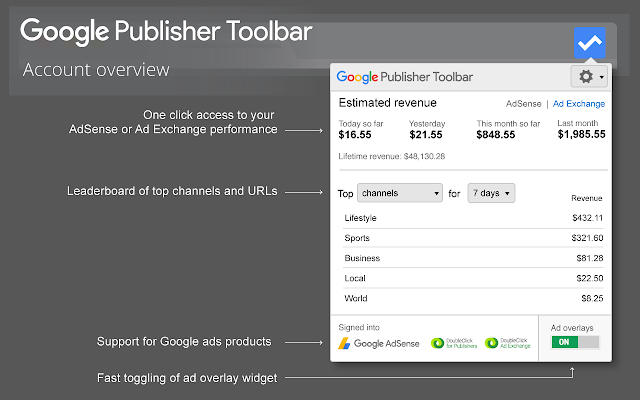 Sign in to DoubleClick for Publishers. Choose the Ad Exchange historical report type. Choose the date range you want to review. Add the Days dimension. Optionally, add the Channels or URLs dimensions and filters. Add the Estimated revenue metric. Follow the steps below to block an ad served through Ad Exchange. Learn more about how to block an unwanted ad. Click Delivery Creatives Exchange creatives. Find the unwanted ad you want to block from delivering. Hover your pointer over the ad and click Block. Open the webpage you want to troubleshoot in your browser. Option 2: Append the ?google_force_console=1parameter to your webpage's URL and reload the page. Click Troubleshoot to see even more information in DFP. If you're an Adsense user, you can continue to enjoy using the Google Publisher Toolbar, but if you've already migrated to DFP in order to seriously serve ad placements, you'll have to start spending more time in its native platform. Which personally is a clunky interface and not welcoming to everyone, so be patient the learning curve will be steep. As Google begins to restructure its marketing offerings, the rollout will see plenty of changes, and we will try to keep you up to date with each update. So sign up to our newsletter or bookmark our site for regular updates.